Based on Thomas Adrian's Swedish postcodes database, I've created a function for our company's Sametime bot which returns the post codes(zip codes) for a specified city or the city name by specified zip code. 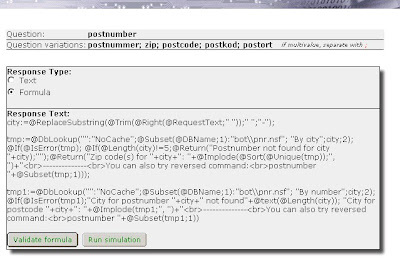 All you need to implement this functionality in the free evaluation version of Botstatiuon Bot is to create a "pattern answer" with @formula which makes lookup to the database. Similar formula can be used for any database lookup from bot. Later I will add bot function to lookup for phone area codes for cities in USA and Sweden. With Sametime Widget (STWidget) AJAX-based tool you can make a live test of the function. @RequestText function above is translated by Bot into the incoming command text, for example "zip 12345". An alternative way to find zip code is to make call to a Web Service, which is also possible with Botstation Sametime Bot, I'll show how to accomplish it in some of the posts later this month.